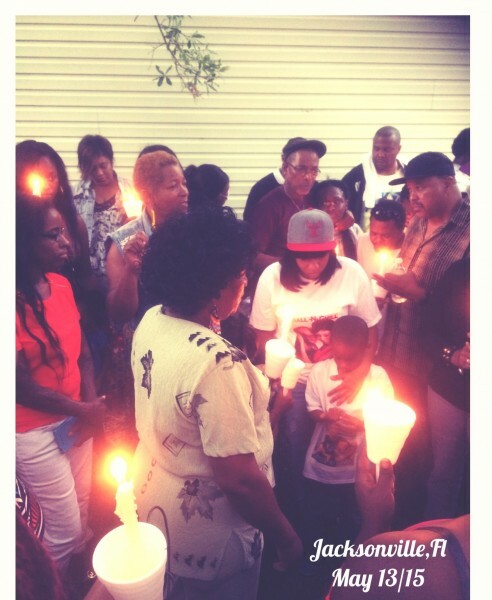 Jacksonville community gathers for D'angelo Stallworth, killed by police | Fight Back! Jacksonville, FL - Over 100 people attended a candlelight vigil at Planters Walk Apartments, May 13, in response to the police killing the day before of D'angelo Reyes Stallworth, a 28-year-old African American worker. Stallworth's family called the vigil, which brought out friends, coworkers and supporters from around Jacksonville. Stallworth worked at the United Parcel Service hub in Jacksonville, which is one of the three largest ground hubs for the company in the U.S. He was on medical leave from UPS when he was killed and was recently diagnosed with multiple sclerosis. Stallworth was due to return to work the following week. More than a dozen of his coworkers at UPS attended the vigil, many wearing UPS and Teamsters shirts.